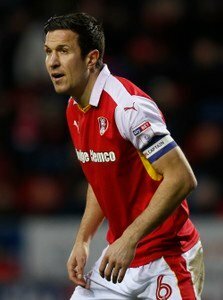 Rotherham United skipper Richard Wood says that today’s game is going to be tough and perhaps making it a bit tougher is that the Millers want to finish in that fourth place they occupy now. Speaking to iFOLLOW Woody said, ‘We want to finish off with a win in front of our home fans which will take us into the play-offs in good form. ‘The Gaffer is constantly on at every player telling us to win and with my experience I know it as well and am trying to give that to the lads too. I’m talking to the lads all the time and am trying to help them all I can. so even if we had fourth place already secured it wouldn’t have made any difference, we want to win the game. If you’re winning games it breeds confidence and we need to make sure we are going into the play-offs in that mood. Talking about last season, Richard said, ‘From last season how bad it was the Gaffer has turned it round with good signings, keeping good players. We’ve performed brilliantly this season. We’ve had ups and downs but it’s generally been excellent and the fans can be very happy.